Every religion has a place of worship. For Christianity, there are three terms to refer to it, each connoting a different meaning. Whilst a chapel is small and usually located in larger places like airports, a church is larger with the term also referring to the parish. In a Cathedral, one would find a symbolic seat – the Sedia vescovile – which belongs to the Bishop. Consequently, this would make the Cathedral of Mdina the most important church of all the Diocese where most of the liturgical events are held. The Bishop, who represents Christ, heads the congregation in its journey as a Christian community. According to local tradition, the first Bishop of the Maltese Islands was Publius who, at the time, was the acting governor of the Roman Melita. Saint Paul’s shipwreck in 60 A.D. was essential for the locals to get in touch with the Gospel. Chapter 28 of the Acts of the Apostles narrate how Paul healed the governor’s father during his three-month stay on the Island. It is very likely that Paul was not only preaching the word of God to the locals, but also converting them to Christianity. 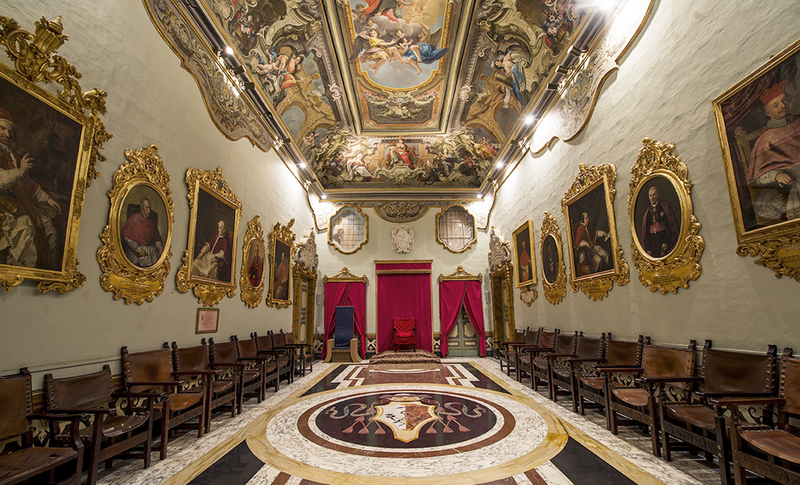 Tradition also holds that the present Cathedral in Mdina was built in the same area where Publius’s residence was. Primary sources, including manuscripts and original artefacts, are limited in the first 600 years of Christianity in Malta. During the Byzantine period until the first half of the 6 th Century A.D., the local Diocese was subjected to the Holy See in Rome. After 1154, it formed part of Sicily’s Palmeritan See. Records suggest that the Muslim rule between 870 and 1090/1, the religion of Malta was Islam although it seems that Christianity had not ceased to be followed altogether. With the re-Christianisation of the 11 th Century, Malta’s Diocese was prevailed from overseas. The first recorded bishop of Maltese descendance is known as ġakbu, a Franciscan priest who was nominated by Pope Gregory X in 1272 under the Aragonese rule. Evidence suggests that Henry of Cefalù, who was chosen by Pope Gregory XXII in 1134 as the Bishop of Malta, chose to reside in the Bishop’s Palace next to the Cathedral of Mdina where he was buried in 1341. A Bishop who left a great impact on the local Ecclesiastical history was Senatore de Mello who inhabited in Sicily and arrived in Malta in 1436, four years after being nominated by Pope Eugene IV. De Mello appointed a commission made up of four Cathedral Canons to research about the benefices and the existing parishes at the time. This list of information was known as Rollo de Mello. De Mello died in Catania in 1445. With the cession of the Maltese Islands as a fief to the Order of St. John in 1530, Emperor Charles V (as King of Sicily) reserved the right of sovereignty over the Islands for himself; a right which was acknowledged with the yearly presentation of a falcon on All Saints’ Day. During the Order’s stay, until 1798, most of the Bishops were nominated by the Grand Master and the Council to the Vice Roy of Sicily which had to be approved by the Pope. The last Bishop to be presented to the Pope by the Sicilian king was Ferdinando Mattei in 1807. With the arrival of the British in 1800 and as of the appointment of Ferdinando Mattei in 1807, the selected Bishops were to be born in the Maltese Islands. Mattei, a former Bishop of Rhodes, was the first bishop to be a member of the Cathedral Chapter of Mdina and declared the Conventual Church of St. John in Valletta as a Co-Cathedral from where he managed. In 1863, there was an eminent development when a separate Diocese was set up in Gozo – Malta was now considered as an Archdiocese, its Bishop’s rank would escalate to that of an Archbishop, and his Church would be referred to as the Metropolitan Cathedral. In the 20 th Century, the Maltese Diocese was formed by five bishops – Michael Gonzi was one of the most important figures, being an Archbishop of Malta between 1946 and 1976. During these thirty years, Gonzi carried out several reforms in the local Church according to the regulations of the Second Vatican Council, while leaving a huge impact on Maltese politics and society. During his reign as an Archbishop, the Cathedral Chapter opened a Museum to the public with its first location being the Cathedral itself and later, in 1969, moving its premises to the old Seminary. Domenico Cubelles: a Spanish-born who ruled the Maltese Church between 1541 and 1566 during the age of Protestantism in Europe. This revolution in the Christian faith caused the Council of Trent between 1545 and 1563 triggering the Counter Reformation which had to be followed by all the Bishops. Cubellas was the last official representative of the Medieval Inquisition and the first Inquisitor of the Roman Inquisition in Malta whose tribunal was founded on the 21 st of October 1561. He was also the Bishop during one of the most important events in Maltese history: The Great Siege of 1565. Paul Alpheran de Bussan: a refined Bishop of French descendance who ruled between 1728 and 1757. This Bishop initiated the function of Consecration of several parishes and sanctuaries. His interest in the Seminarists’ academic and spiritual knowledge led him to ask for a transfer of the institution from Valletta to Mdina in Don Petrus Cassar’s residence. Between 1733 and 1740, Bishop Alpheran built a new seminary next to his palace with its Baroque structure dominating the Archbishop’s Square. The building was passed on to the Cathedral Chapter. Davide Cocco Palmeri: an Italian Bishop who led the Diocese between 1684 and 1711. During his rule, he founded several parishes around Malta and Gozo and built the Seminary in Mdina in 1703. Cocco Palmeri was forced to make the decision to rebuild the Cathedral – which stands to this day – due to the impairments caused by the earthquake in January 1693.